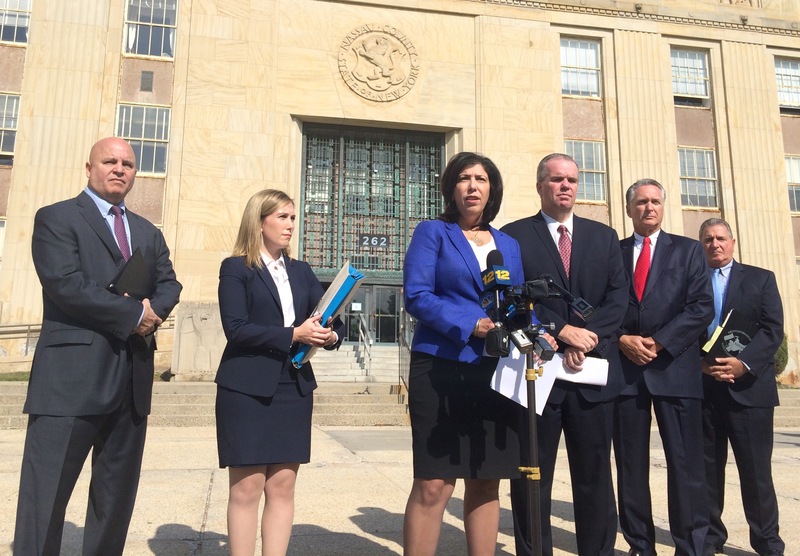 MINEOLA, N.Y. – Acting Nassau County District Attorney Madeline Singas announced the arraignment of a reputed MS-13 member wanted for a 2002 shooting, in which he allegedly shot and killed an 18-year old man on a Roosevelt street and immediately fled to Central America. Wuilmer Mendosa, 32, was arraigned today in front of Acting Supreme Court Justice Teresa Corrigan on the grand jury indictment charge of Murder in the 2nd Degree (an A-I violent felony). If convicted, Mendosa faces a maximum sentence of 25 years to life in prison. He was remanded and is due back in court on October 21. Acting DA Singas said that on the night of October 24, 2002, at approximately 9:38 p.m., Mendosa, also known as “Chicky,” and other reputed members of MS-13 were on East Raymond Street in Roosevelt. Johnathan Harris, who had just celebrated his 18th birthday five days earlier, was on his bicycle and with two friends. The gang members – armed with bats, knives and a gun – asked the victim if he was a member of a rival gang. Harris said, “No,” and was then shot four times, allegedly by the defendant. The victim was struck twice in the chest, once in the abdomen and through his right arm and pronounced dead shortly after. The defendant and other gang members fled the scene in a vehicle that was waiting nearby. Mendosa discarded the gun, borrowed money and quickly fled the country. The defendant was believed to be in Central America until May 5, 2015, when he attempted to reenter the United States on a flight from El Salvador to Texas. Special Agents from Homeland Security, alerted by Nassau County Police Department detectives, stopped Mendosa after his flight. Mendosa was indicted by a Nassau County grand jury on June 5, 2015, and the extradition process was initiated. The defendant was returned to New York on October 7, by members of the Nassau County Police Department. Assistant District Attorney Christine Geier of Acting DA Singas’ Major Offense Bureau is prosecuting the case. Mendosa is represented by Brian Carmody, Esq.